Wonderland was a once in a lifetime adventure to say the least. Reflecting back on our amazing trip, it’s hard to believe that a simple (crazy) thought 6 months ago to run the entire Wonderland trail had actually turned into reality for a group of us. Just a bit (or a lot) of logistical planning, a couple just as crazy runners, a die hard aspiration and love for the trails, and we had our goal set out for us. 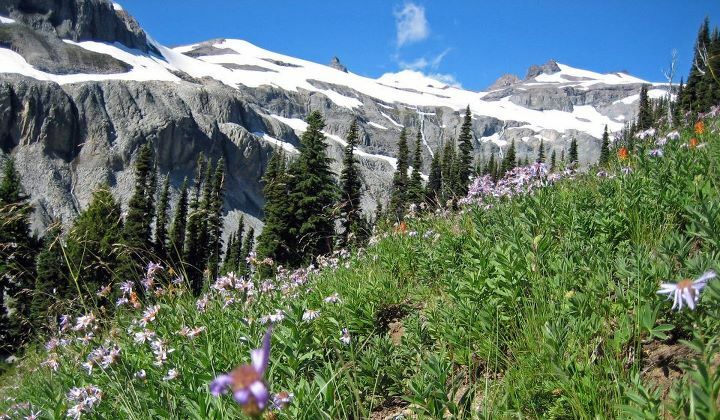 The Wonderland trail is a 93 mile trail that circumnavigates Mt. Rainier in Mt Rainier National Park, Washington. It had over 22,000 feet elevation gain and is one of the most gorgeous trails I’ve ever been on. The Pacific NW is my favorite place to run because of the lush forested areas (ie: Mt Hood), but you can only go certain times of the year due to rain and snow. 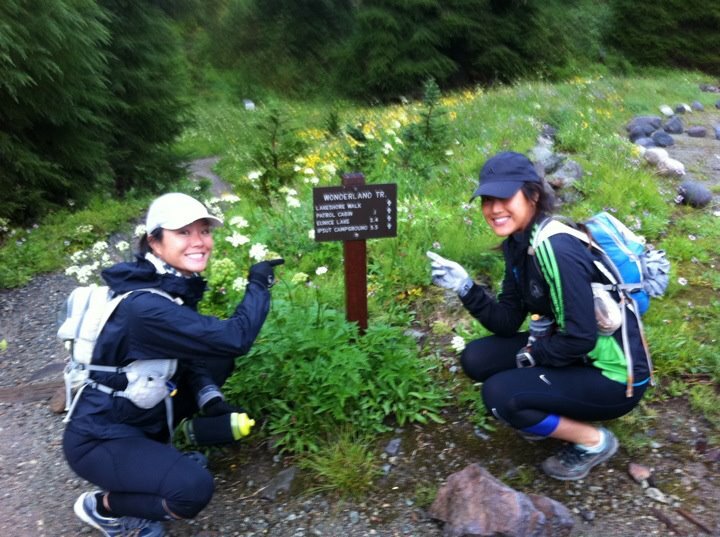 We planned to tackle the trail over the course of three days running 30-34 miles a day Friday, Saturday, and Sunday. Needless to say, it would be long and tiring days but the challenge was too great to pass up. And did I mention that we are a little crazy? We flew into Seattle Thursday afternoon, picked up a rental car and drove to our cabin in Ashford. At night we dropped one car off at the ending point for our first day. Since each day would be a point to point run, it required us to plan ahead in terms of cars. The very last day we would end up right back where we started since it was a big loop. Friday morning came too soon and by 4:30AM everyone was out of bed. We drove 2 hours to the trail head at Frying Pan Creek, which was 2 miles from where we had originally wanted to start. We knew this meant our last day would be a bit longer than the planned 26 miles. We each carried a 2 liter Camelbak and a handheld. Since the water took up the majority of our pack, we had little space for actual food. You had the option of stuffing your pack with 20 gels or bringing high calorie compact food. I went with the latter option as gels make me gag and when I’m running for a long time, I want to eat real food. Everyday I brought one Pure Protein bar (300 cal), one salami sandwich (250 cal), a packet of honey stingers (160 cal), a packet of almond butter (200 cal) and a handheld of Gatorade for electrolyte replenishment. I ate pretty much everything I had packed except for the packet of peanut butter. Probably not enough food for running 8-10 hours a day but I felt fine with that amount. Finally we arrived at the start with all smiles, Garmin charged and ready for a long day on the trails. 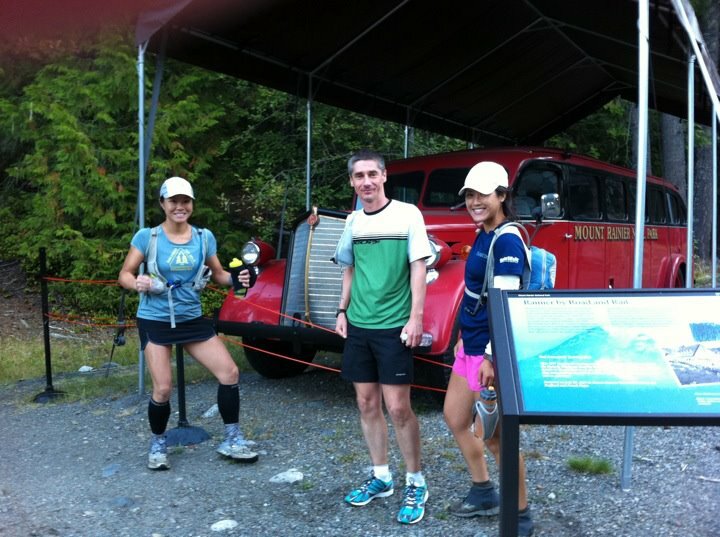 We started climbing immediately and since we all had fresh legs, we ran most of the hill finally getting to Summerland. 4 miles in and we could already see Mt. rainier. The weather on Friday was absolutely perfect, even a bit warm at times but not like the rainy Seattle I had envisioned. After a couple pics, we started the grueling trudge through the glaciers. I was really not expecting to be going through that much snow. It slowed us down a lot because sometimes it would be hard to find the trail in the snow. Luckily, the trail is well maintained and they had park flags every so often stuck in the snow to let you know you were going the right way. The scariest part was having to climb through the snow. Sometimes we would be on our hands crawling up the side of a mountain afraid to let go and slide all the way down. Trail shoes are not meant for snow shoeing, however, the scenery was breathtaking. We were literally on Mt Rainier, the closest we would be the entire trip. 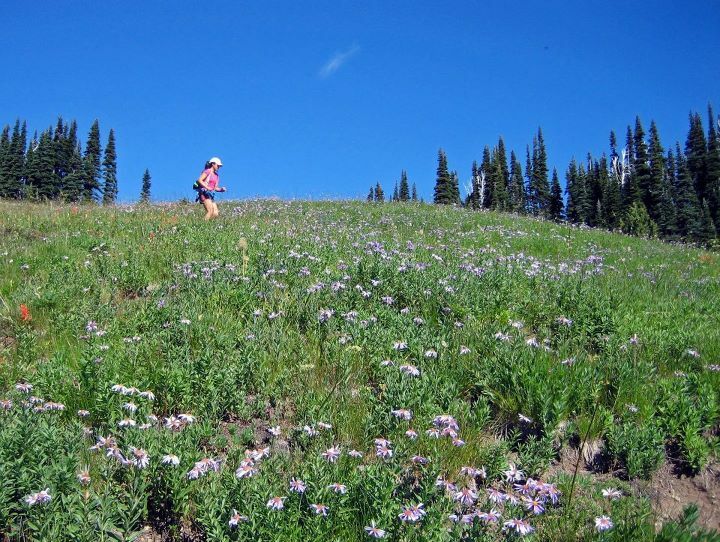 When we weren’t running through snow, we were going through fields of flowers. It felt like we were running against a backdrop. Flowers in full bloom in September? It was incredible. This was exactly how I pictured wonderland to be. There were lots of stairs we had to climb up and down through the meadows, wooden bridge crossings, jumping across streams. Water was plentiful on the trail since it all comes from the mountain. There were huge waterfalls and water gushing everywhere. I started to bonk around mile 15 when we had already been running for so long and we were only halfway there. The snow and climbs early on took a lot out of me. We trudged on looking forward to the next trailhead. The trail is very well marked with a lot of mile markers to the next point of interest. This helped break up the run, so instead of counting down from 30, I would say to myself that it would only be another 3 miles until the next stop point. We had to carry a Steri Pen to filter our water since there was no purified drinking water on the trail. This was usually our longest break since it took a while to fill 4 Camelbaks and handhelds with treated water. We ended up seeing a deer the first day who wasn’t shy at all when we approached it. The day finally came to an end when we saw the Longmire sign and we finished with a nice downhill. Tired, but happy to be finished we high tailed it to our cabin to rest up for Day 2. I knew this would be the hardest day out of the three. Not only was it the longest, but we were going to going up over 8,000 ft elevation gain. Basically, the day consisted of climbing up steep hill, running down steep hill x 5. Yeah, it was a long day. I woke up stiff, walking like a zombie and my feet was killing me. I wondered if running for 10 hours would be a good idea…I mentally prepared myself for the worst and told myself that I could go as slow as I wanted to, just as long as I made it through the day. 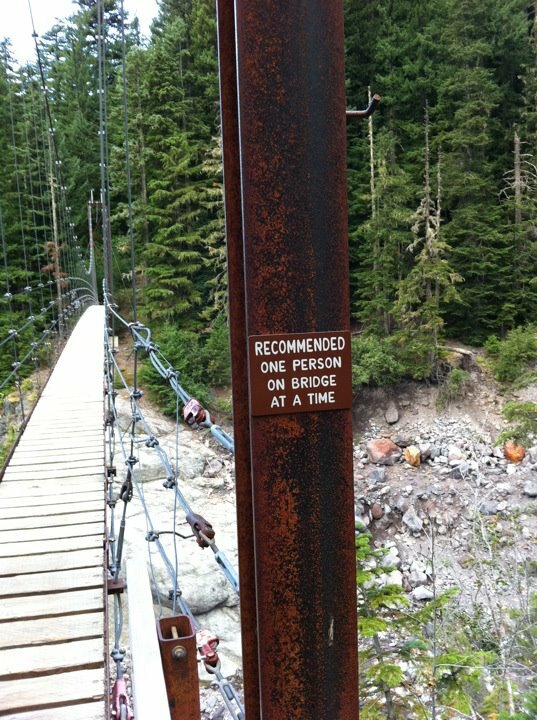 This was also our first day hitting the long awaited suspension bridge over Tahoma Creek. It is the highest, longest and strongest bridge on the Wonderland. It is 250′ long and 100′ above the creek. I was terrified going over such a long suspension bridge. It was one of those bridges that moved when you walked and I felt like if I leaned over one side, the whole bridge was tilt. Most of the day was climbing in and out of the forested trees. 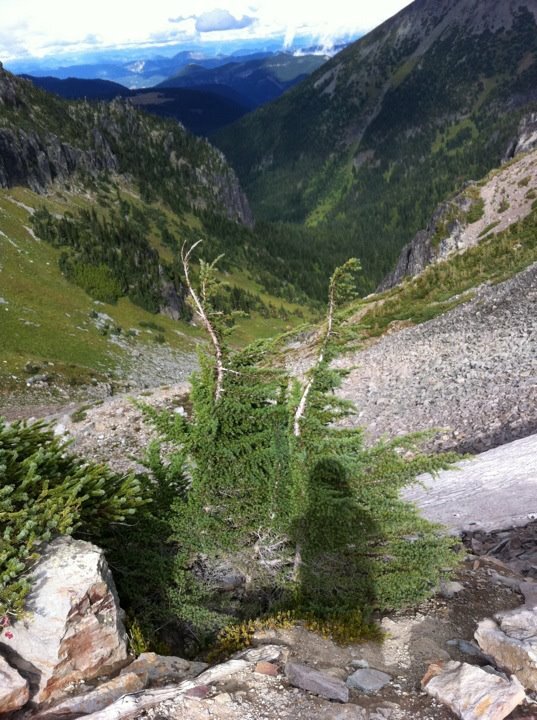 We would climb above the treeline and then back down. There was literally no flat parts of this day. Fortunately, we had another day of great weather. Slightly cooler than the first day, but not too cold to run in. We hit a couple fairly exposed areas on the trail where the wind would pick up. Once we hit Golden Lakes with 10 miles to go, I crashed hard. We were climbing again and when we ran back down, my eyes were half open. I was tired, under fueled and exhausted from all this running. We were already 8 hours in and I could feel my energy slowly start to drain away. I fell again going downhill, luckily on the soft dirt and that actually shook me awake. We made it to the river crossing and I told my friends I was bonking hard. I told them to go ahead and I’ll meet them at the finish. They refused to leave me behind and asked if I had eaten anything. I realized all I’ve had to eat all day was a protein bar, Gatorade and water. I grabbed my sandwich and started eating that while climbing uphill. I don’t really like stopping to eat, as any movement forward just brings me closer to the finish. I figured I could eat while I hiked up the hill. Instantly, I felt my energy lifted. It was amazing how quickly the food burned through my body and I felt so re-energized for the last 4 mile trek uphill. Even though 4 miles on another day might seem like nothing, the trail to Mowich Lake is persistent. It climbs with little relief for nearly 4 miles. We figured we had another 1.5 hours on the trail before we finished. It started to get dark since it was past 6PM and we were in the forest. I busted out my headlamp and iPod (the only time I listened to music on this whole trip) and trekked on. This was probably the fastest I have ever hiked. I was pumped and ready for the day to be over. 2 miles from the end, we bumped into a hiker who was going the opposite direction. He was completely lost and asked to join our group back to the trailhead. We kept pumping along the trail, but the hiker couldn’t keep up. He kept asking us to stop, but we told him he had to keep moving. Even if he hiked slowly, he had to keep moving forward. We probably sounded really mean, but it was the only way for all of us to get out of the mountain. The nighttime hike was eerie, since visibility wasn’t so great, I had to watch the ground a lot for roots and rocks. When I heard water, I knew we were about to go over a water crossing. Crossing a log bridge in the night is scary! Finally we made it to the top where our friend was waiting with the car. I have never been so happy to see the car and sit down. Diet Coke, turkey jerky and pretzels were consumed on the way back to the hotel. Food has never tasted so good after being out on the trail for 11 hours. Since we had ended our previous day climbing, we started Day 3 with a nice steep downhill. The downhills on Wonderland aren’t really the easiest of downhills. They’re technical, rocky and very steep. It’s hard to really “make up time” because you really have to watch your footing. My legs actually felt better today albeit my feet were still swollen and I had a nice black and blue bruise on my left leg from a fall on Day 1 on some volcanic rocks. Mentally I was ready to be done with the trail. We estimated 9 hours for this day since mileage was a bit shorter (29 miles). Unfortunately, rainy Seattle settled in overnight making the trail damp and muddy. It sprinkled here and there throughout the day, even snowed towards the end! It was hard to tell how much it was raining since we were in the forest for most of the day and the trees catch a lot of the rainfall. The trail started dropping rapidly down the east wall with a series of fairly steep switchbacks. The section to Isput Pass was beautiful, we gained 171 ft and lost 2,880 ft. We soon came upon Carbon River which is laden with rock flour making the water unfit for drinking. The water’s opaqueness also makes it impossible to tell how deep it is at any given point. 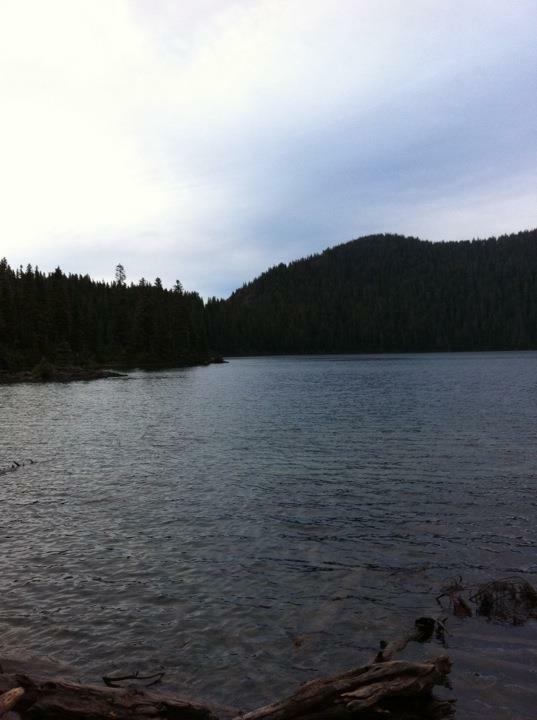 The water is extremely cold, runs very fast, and is full of tumbling boulders and other debris. 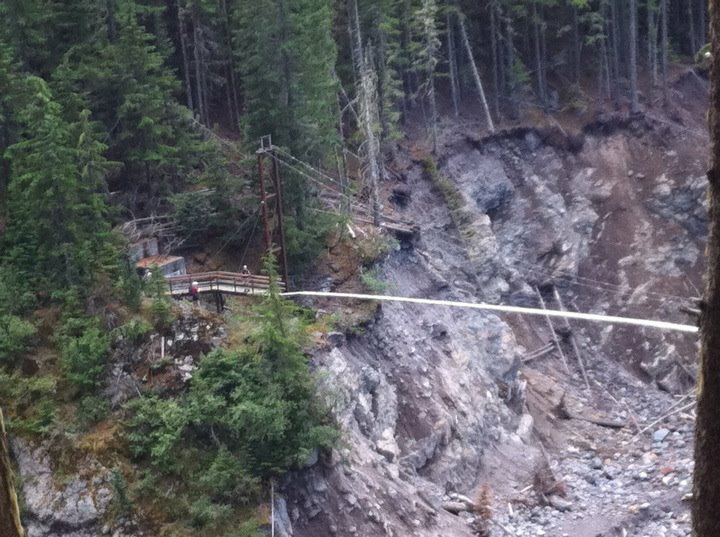 There was another suspension bridge here, but fortunately we didn’t have to cross it. With all the downhill came the steep uphill. We climbed over 1,100 ft in a mile. The rocky trail continued to climb across the steep bank of the glacier. I was bonking at the point from all the climbing. The climb just never seemed to stop. I focused on going one step at a time, but sometimes it felt like I was at a standstill since I was moving so slowly. I dragged/trudged my feet along before finally seeing the tree clearing. My friends were waiting for me and were filling up their water. You would think spending 28 hours on the trail with people, you would run out of things to talk about. But it was actually the opposite, when we ran/hiked together, it was pretty silent. I was too tired to talk or even think of what to say besides asking “how much longer until next trail head” or “are we doing anymore climbing”. Everyone focused on the trail ahead and fought their own battles each day. We all bonked at different times and took everything we had to get us out of that place. It wasn’t pretty, but coming out of it only made us stronger. It’s inevitable to hit the wall when ultra running. No matter how much fuel or water you are taking in. It is mentally exhausting and physically demanding on the body. When we hit Sunrise, it was the highest point we would have to go for the day. At 6,400 ft, this “top of the world” park sits astride a three mile long plateau with an eagle’s eye view of Mt. Rainier, Little Tahoma and the Glaciers. 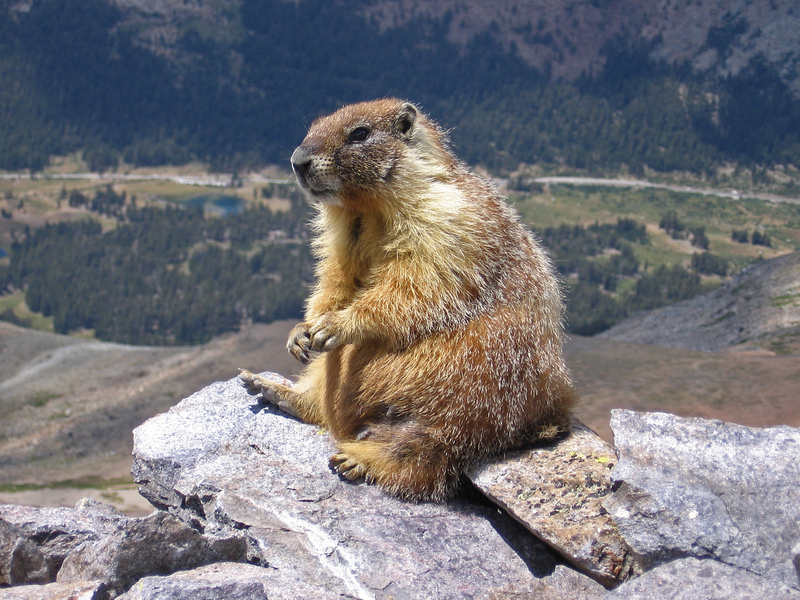 We heard a lot of marmots along this part of the trail since it was so open. Apparently they scream/whistle to ward off predators which was amusing since we all thought we were whistling at each other from different parts of the trail. This was also the part where it started to snow since we were so high up and close to the mountain. It wasn’t too bad, just flurries, but it got pretty cold. Good thing I brought gloves and a wind breaker. The next section from Sunrise to White River was our last and final stretch. It was a steep 2,100 foot descent down to Sunrise and with only 2 miles to go until White River, we all left out a sigh of relief and excitement that we were so close to finishing. However, we had parked our car at Frying Pan Creek since we couldn’t find designated overnight parking at White River, which was another 2.6 miles away. Again the mileage doesn’t seem long, but when you have 90 miles underneath you over 3 days, even a mile seems long. Fortunately, the 2.6 miles was on a descent/flat trail. We all powered through it running 10 min/mile splits towards the end! We were so ready to be done and when we saw our car from the very first day of dropping it off, it was the happiest moment of the trip. 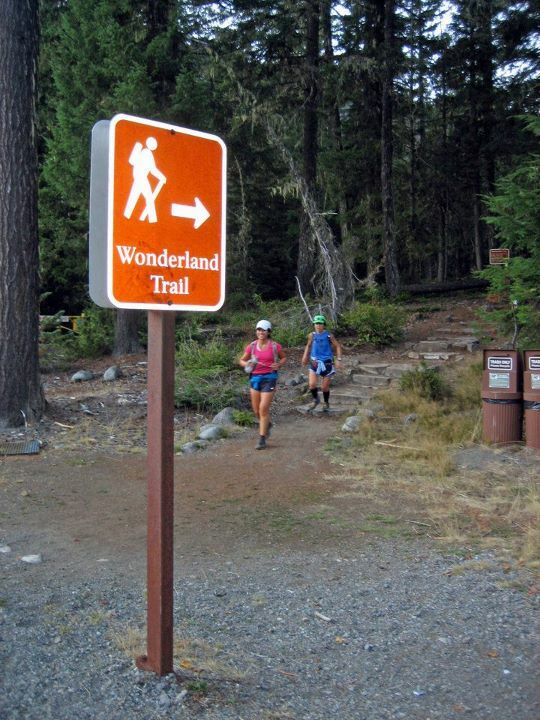 Knowing we had completed the entire freaking Wonderland trail in 3 days. 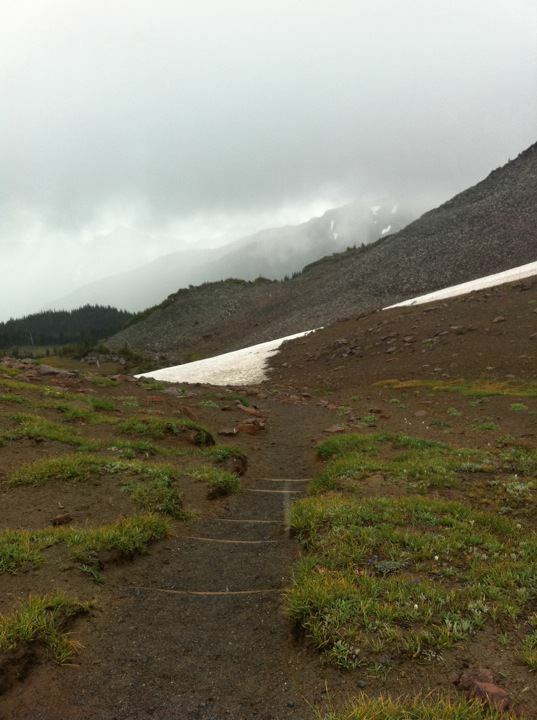 I often thought about this exact moment on the trail, of finishing and accomplishing something so big and challenging. We all dug deep everyday to keep going and finish what we came here for. Wonderland was truly an epic experience that I will never forget. We came on the perfect weekend with some of the greatest people who love the trail as much as I do. No one complained on the trail of backing out, everyone stuck with the plan and finished with huge smiles on our faces. I can’t wait to come back again sometime and maybe run it again. My Garmin registered a 7:30 min max pace in that last mile – man, we were pushing hard, considering the miles on our legs at that point! Nice trip report. For being physically drained, sleep-deprived, and prone to crankiness, the group did pretty well in keeping it together. What an amazing adventure. The photo’s are amazing and love the video. I am a CA girl now, but lived in WA for 21 years and forget how beautiful it is. That emerald green makes up for all the rain! Very inspiring post, thanks for sharing your journey! I only found this today…. Andee, thanks a lot for writing this! I really like thinking back about the trip and day-dreaming about the next one. @ Helen, I didn’t notice anybody prone to crankiness 🙂 It’s true we were all really quiet at times, but that was not a bad thing at all!